Wireworld launches 'Mac-friendly' glass optical cable | What Hi-Fi? That, the company says, makes the new Supernova 6 "the first optical digital cable with glass conductors compatible with the optical digital audio output of Apple Mac computers." Wireworld president David Salz says that "The optical digital connection standard is often considered to be second rate compared to the coaxial standard, because most optical cables have low-bandwidth plastic conductors that reduce fidelity. "The emergence of optical digital cables with glass fibre conductors has proven that the optical cables can often outperform coaxial cables, while providing better isolation from noise, a benefit that can be especially helpful in computer audio applications." 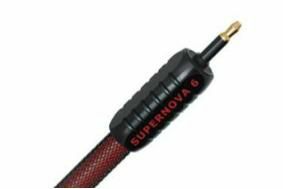 Supernova 6 uses a core of 280 glass fibres instead of the more common plastic monofilament, and is available in lengths from 0.5m to 8m, with prices starting at £108.95.